Only Seniors can take part in this hobby! Tap the Quilting Kit and tap the Quilting action (8hours!) 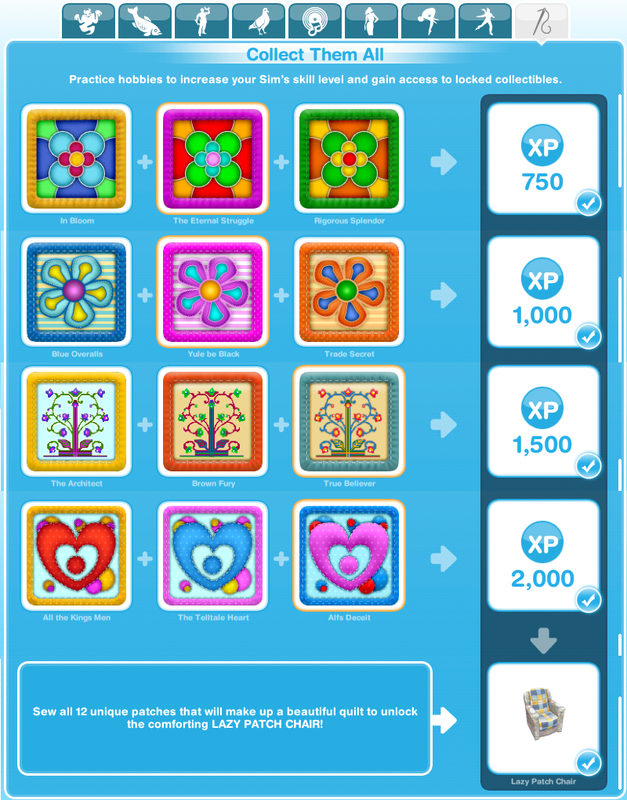 and wait for the time to pass, you'll earn the indicated XP when it finishes as well as one of the quilt patches. Please note: patches already collected will NOT yield the rewards again if filled in on the collectibles grid. The first time unlocking all the collectibles for quilting unlocks "Lazy Patch Chair", which can be found in the Home-Store under Living Room. The second time completing the collection unlocks "Patchpouri Couch", which can be found in the Home-Store under Living Room. The third time completing the collection unlocks "Quiltinator 5000" (Patchwork Bed), which can be found in the Home-Store under Bedroom. Please note that these pieces of furniture are only UNLOCKED, you still have to buy them. WARNING: Tapping "Quilt Again" does NOT give you an option to cancel!